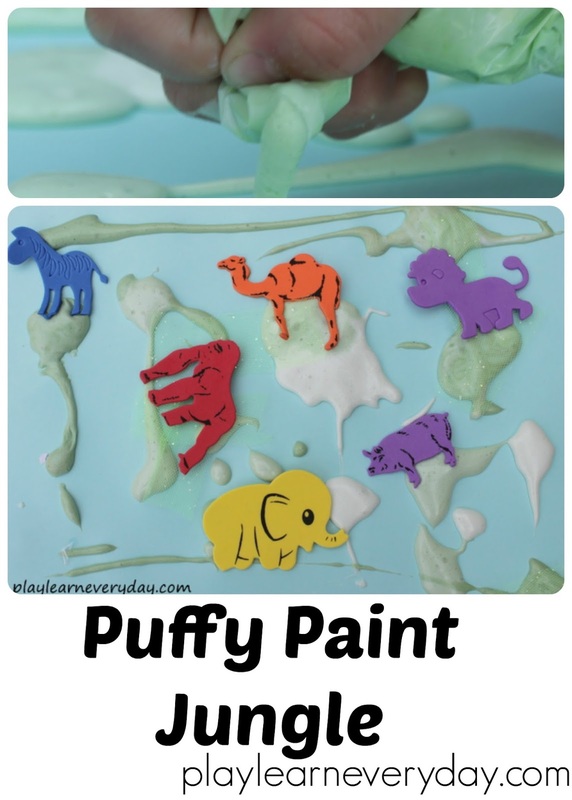 If you're looking for a fun new way to make fabulous artwork and crafts with the kids, then you've got to try puffy paint! It's a whole sensory experience in making the puffy paint, fine motor skills in squirting it out and lots of creativity in making your picture! I found several different recipes for puffy paint online, but decided to come up with our own very simple version. I decided that measuring glue and shaving foam was not going to be easy, so instead I went for the basic idea that I wanted double the amount of shaving cream to glue. I used paint pots to mix up three different colours of puffy paint, starting by squeezing the white glue about a quarter of the way up the pot, which was also a great way to finish off a few bottles of glue that were nearly empty! Then squirting shaving foam to make the pot about three quarters full. Luckily I don't think that it's an exact science as different amounts came out in each paint pot and all three of the puffy paints turned out fine. Ivy helped me to mix the glue and shaving foam together, she really enjoyed stirring it around and seeing the two substances come together. Then we added different amounts of green food colouring to each one to make different shades of green for our jungle. Ivy stirred each of these in too, and was amazed at watching the puffy paint turn green! We then scooped the puffy paint out of each of the pots and into zip seal sandwich bags. I then snipped a tiny hole in the corner of each of the bags before setting them up for the children. Ethan got the hang of it straight away and was using the different shades of green to draw all sorts of different trees and leaves in his jungle. He really enjoyed this different technique to creating something and happily got on well without any help from me. Ivy found it difficult to squeeze the paint out of the bags, she would squeeze but often ended up with the hole in her hand and making a big mess all over herself (which she isn't enjoying at the moment!) so she definitely needed a hand in aiming the paint around her picture. An alternative would be to put the puffy paint into squeeze bottles, which we may try next time. It was also a chance to explore what the puffy paint feels like when it's dry. This part Ivy really enjoyed, because she could touch it without getting messy! The glue gives it a layer of smooth skin over the top with the fluffy shaving foam underneath puffing it up and squishing around under your fingers. So much fun to play with! We loved playing with puffy paint, the effect is fantastic and definitely something that we will be trying again for different projects.